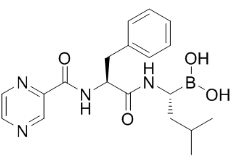 Bortezomib (PS-341) is a potent 20S proteasome inhibitor with Ki of 0.6 nM. in vitro: The average growth inhibition of 50% value for Bortezomib across the entire panel of 60 cancer cell lines derived from multiple human tumors from the US National Cancer Institute (NCI) is 7 nM. Treatment of PC-3 cells with Bortezomib (100 nM) for 8 h results in the accumulation of cells in G2-M, with a corresponding decrease in the number of cells in G1. Bortezomib kills PC-3 cells at 24 and 48 hr with IC50 of 100 and 20 nM, respectively. Bortezomib induces nuclear condensation at 16–24 hr after treatment. Bortezomib treatment leads to PARP cleavage in a time-dependent manner with concentrations as low as 100 nM being effective at 24 hr . Exposure to Bortezomib has been shown to stabilize p21, p27, and p53, as well as the proapoptotic Bid and Bax proteins, caveolin-1, and inhibitor κB-α, which prevents activation of nuclear factor κB-induced cell survival pathways. Bortezomib also promots the activation of the proapoptotic c-Jun-NH2 terminal kinase, as well as the endoplasmic reticulum stress response. Alteration of the levels of these cellular proteins leads to inhibition of proliferation, migration, and promotion of apoptosis of cancer cells . in vivo: The anticancer effects of bortezomib as a single agent have been demonstrated in xenograft models of multiple myeloma, adult T-cell leukemia, lung, breast, prostate, pancreatic, head and neck, and colon cancer, and in melanoma . Oral bortezomib 1.0 mg/ kg daily for 18 days causes tumor growth delays, as well as a decrease in the number of metastases in the Lewis lung cancer model. Bortezomib at a single dose of up to 5 mg/kg significantly decreased the surviving fraction of breast tumor cells. Bortezomib 1.0 mg/kg administrated weekly for 4 weeks reduces tumor growth by 60% in murine xenograft models of prostate cancer . Bortezomib, a first-in-class proteasome inhibitor, induces apoptosis and growth arrest and reverses chemoresistance in myeloma cells and has demonstrated no irreversible adverse effect on haematopoietic stem cells. Bortezomib has shown in vitro and in vivo activity against a variety of malignancies, including myeloma, chronic lymphocytic leukemia, prostate cancer, pancreatic cancer, and colon cancer. The drug is rapidly cleared from the vascular compartment. Bortezomib showed promising activity in relapsed mantle-cell lymphoma and encouraging results in other B-cell lymphomas.